I feel a lot of affinity for her because she spreads herself thin (referring to me) or is a genius polymath (referring to her). She gets her fingers in a lot of pies - she was trained electro-acoustic, then was part of the folk scene, she wrote songs that Elvis sang, like 'Until It's Time For You To Go', she wrote a song that won an Academy Award, 'Up Where We Belong', she appeared on Sesame Street, she made Illuminations, which is referred to as the first folktronica album. The thing I especially like about her is that she's approaching her 70s and is still very much an activist. She essentially lives in Hawaii raising goats, she's got her life figured out, but she also spends a great deal of time touring reservations in Canada and making new music, and her new music is unbelievable. 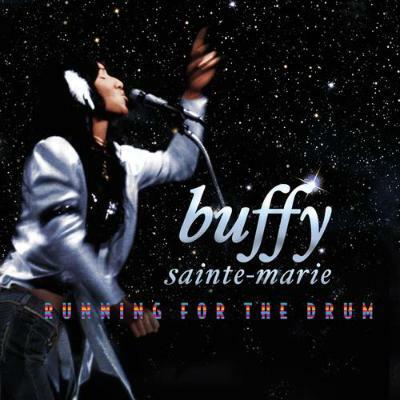 This record, Running For The Drum... the only other die-hard Buffy Sainte-Marie fan I know is Patrick Wolf, and we both agree that this is one of her best records. I'm really into people making records when they're approaching their 70s, I think it's really exciting.